It takes a brave pianist to produce a revisionist recording of such a ubiquitous coupling as the Grieg and Schumann piano concertos. Howard Shelley calls upon the authority of the metronome markings in Schumann's score which have, he tells us, been routinely ignored in the performing tradition of that work. This approach spills into the Grieg which is given a swift account, based on slightly more circumstantial evidence from Percy Grainger. One advantage is that with both Grieg and Schumann coming in a well under 30 minutes in duration, we have room for a very generous coupling in the form of Saint-Saëns's Second Piano Concerto. Yet while the quality of Shelley's refined pianism is never in doubt, I wonder how listeners will react to his Schumann in particular. As he writes in his own liner note, 'I have been intrigued and slightly puzzled by the tradition of slowing the fourth bar of the Allegro affetuoso first movement to what is effectively no more than an Andante, even though there is no indication of any ritenuto or tempo shift in the score.' He undoubtedly has a point, and justifies his decision to take Schumann's metronome mark at face value by pointing out that Clara, who routinely changed such details in other works when editing her husband's works, did not amend his marking for the first movement of the concerto, a work which she herself had played numerous times. We end up then, with a performance of the opening Allegro that comes in a good minute and a half shorter than we're generally used to. 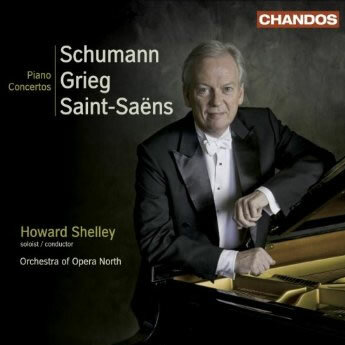 Shelley takes 12'57, compared to, say, Andsnes and Jansons (14'33), Argerich and Harnoncourt (14'24) and, perhaps most surprisingly, a period instrument recording from Staier and Herreweghe on Harmonia Mundi that comes in at a second under a quarter of an hour; Zimerman and Karajan come in at 15'24. The faster tempo undoubtedly makes the movement tauter and far more classical in feel, yet we also lose some of the Romantic impetuosity and fire which has defined the work for successive generations. And Shelley just seems rather too cool, in terms of temperament, to carry off the experiment in the way, say, a Martha Argerich would; where faster tempi might have set sparks flying, I was sometimes left more with an impression of technical and emotional efficiency. Any attempt to peel back layers of performance tradition to return to a composer's original intentions is admirable yet for all Shelley's classy pianism I'm not sure I was convinced; the cadenza, in particular, seems to count for little when rattled through like this. The other two movements are far less extreme, with the intermezzo a little on the swift side and the finale actually more or less what we're used to. As such, I found there was more to enjoy from Shelley's playing, as well as the quality contributions from the Orchestra of Opera North. Again there's the occasional lack of that Fantasie we've come to associate with great Schumann playing, but still a lot to enjoy. The performance of the Grieg is informed by a similar lack of sentimental excess and constitutes a very respectable performance of the old warhorse. I expect again, though, that for all the refinement of Shelley's musicianship, many will simply reach for the more full-blooded, romantic interpretations we're used to; it is, after all, a work built on the language of grand Romantic rhetoric. There's not the blood and thunder in the first movement sweeping arpeggios and double octaves, and the cadenza's grand climax sounds underpowered. The Adagio is beautifully turned, some ugly accenting at the start of some of the demisemiquaver groups notwithstanding, and I greatly enjoyed the refreshing romp through the finale, however, with some particularly vivid contributions from the wind. I suspect, however, that many will still find Shelley's reading a little lightweight compared with some of his illustrious predecessors. The generous Saint-Saëns coupling seems best suited to Shelley's approach, based as it is more closely on classical models. Here the pianist's quicksilver dexterity is shown to its greatest advantage and although he might lack the final dazzling sparkle Stephen Hough brought to his award-winning set of all the works, it makes a thoroughly satisfying conclusion to the disc. Let's hope that Shelley's bold point regarding the Schumann doesn't go unheard; it's surely valid even if the results here are perhaps less than entirely convincing. Nevertheless, with Chandos's usual excellent engineering and two impeccably played couplings, this disc has much to recommend it.